Manresa-Yee, C.; Amengual, E.; Ponsa, P.
Vision-based interfaces can employ gestures to interact with an interactive system without touching it. Gestures are frequently modelled in laboratories, and usability testing should be carried out. However, often these interfaces present usability issues, and the great diversity of uses of these interfaces and the applications where they are used, makes it difficult to decide which factors to take into account in a usability test. In this paper, we review the literature to compile and analyze the usability factors and metrics used for vision-based interfaces. 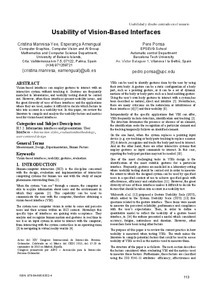 Manresa-Yee, C.; Amengual, E.; Ponsa, P. Usability of vision-based interfaces. A: Congreso Internacional de Interacción Persona-Ordenador. "Actas del XIV Congreso Internacional Interacción Persona Ordenador". Madrid: 2013, p. 113-118.